Kylie Jenner has caused a stir online by getting her baby daughter's ears pierced. The 20-year-old reality TV star has been trying to keep five-month-old Stormi, whom she has with her boyfriend Travis Scott, out of the limelight since she started receiving frightening kidnap threats from strangers online, but she couldn't resist showing off her little one's new accessory on Snapchat. 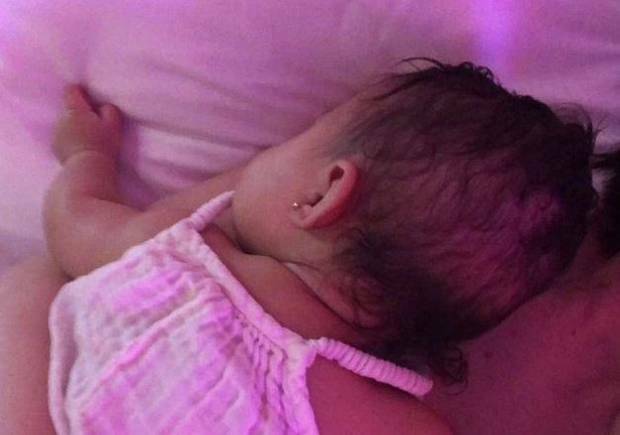 Taking to the social networking site, Kylie uploaded a photograph of the tiny tot asleep on her chest as a gold piercing stud protruded from her earlobe as she faced the camera away from Stormi's face. She simply captioned the shot with two pink heart emojis. The 'Keeping Up With the Kardashians' star's decision to get her baby's ear pierced comes just days after she admitted to fans that Stormi is changing "every week" and has a really "cute" personality. Asked by a fan on Twitter how the little one was doing, Kylie said: "changing almost every week now it seems like. she has the cutest personality (sic)"
Shortly after Stormi's birth, Kylie started uploading photographs of her daughter online but she's since decided to delete all of the pictures that show her face after trolls started targeting the youngster and calling her "ugly." A source said recently: "There have been an increasing number of trolls on social media calling Stormi ugly, and throwing out really horrible insults. "It's been really upsetting for Kylie, because also some of the comments are direct threats to kidnap her. Some people have commented saying it's all Kylie's fault because she has exposed her by putting her on social media. "The haters have always been there, but just getting way, way worse these last few weeks - and calling out Kylie for being a bad mom."